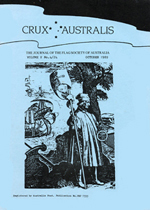 Following is part 1 of the complete listing of all issues of Crux Australis including all the major articles. Minor "notes" and illustrations without text are not included. Issue 4 of each volume includes a full index of all flags and topics contained within individual articles. Articles which do not have an identified author are credited to the editor at the time. Pages in Issues 1-24 were numbered individually, for later issues pages are numbered sequentially by volume. A number of the state libraries in Australia subscribe to Crux Australis and all issues from No. 1 are available in their reading rooms. 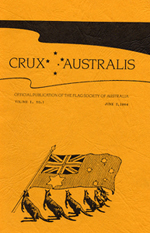 All past issues of Crux Australis are available for sale by Flags Australia, though some early issues are only available as photocopies. Index compiled by Ralph Kelly. © 2018 Material Copyright to the Flag Society of Australia Inc and Pennant Advisory Services Pty Limited. Text and illustrations by Ralph Kelly. Web Design by Elizabeth Kelly of ELK Prints.